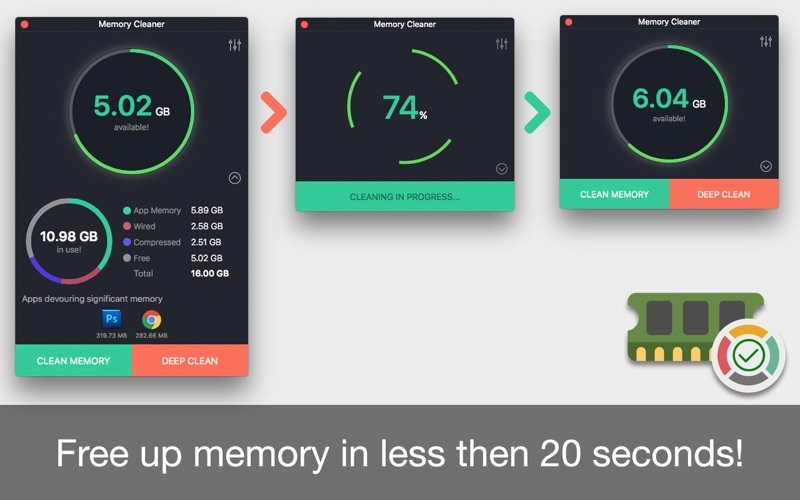 Memory Cleaner – Monitor, Optimize & free-up Memory The application monitors RAM usage on your computer and frees up unused memory with one click. 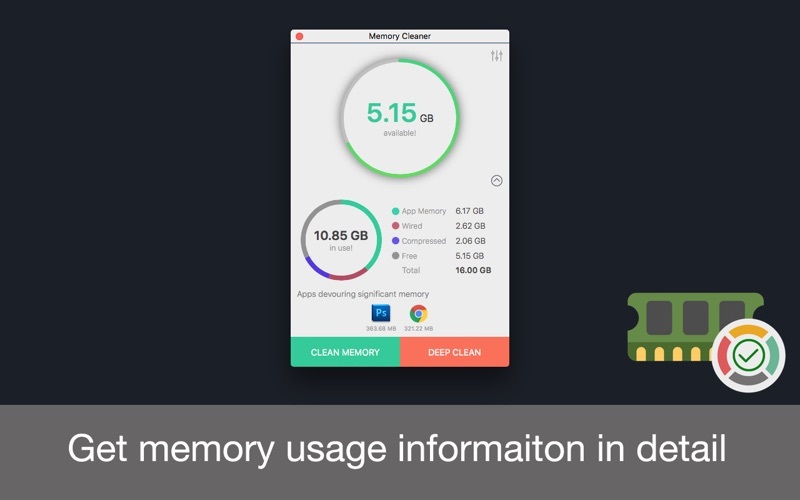 With Memory Cleaner, you can easily manage your memory usage. An animated status icon in the menu bar shows you the percentage of memory being used, as well as memory cleaning being run. ▸▸▸ Automatically memory cleaning starts when consumption reaches the threshold limit set by you. ▸▸▸ Notifications of opened apps those are not been used for a period of time. By closing those inactive apps, memory usage reduces and Mac speed increases. ▸▸▸ Can add important applications to “ignore list” to stop inactive alert message till the time set by you. ▸▸▸ Auto clean Cool down to keep the performance of your Mac high. ▸▸▸ Set Refresh Interval at which you want to get memory usage information. ••• “Deep Clean” is perform by advance clean algorithm for extreme cleaning process, that would take little more time to clean, but will free up more memory space occupied by hogging apps. It is recommended to unlock “Deep Clean” to enjoy ultimate performance of your MAC. Fixed user interface issue at the app start. Implemented animated menu bar icon which indicates memory usage in different color code.